I wasn’t in the mood for Thistle and Shamrock on my drive home from a Sunday afternoon writing siege at Panera’s (a little Celtic music goes an extremely long way for me), and I really wanted to finish listening to the latest On the Media show I had downloaded to my iPod, so I rummaged in the scary bottom floor of my purse for my Kensington digital iPod FM transmitter — but came up with a handful of parts. Somehow the transmitter had separated. The tip, which constrains all the innards of the transmitter, screws off, which is a good thing if I ever need to change the fuse (I didn’t even know it had a fuse until the transmitter deconstructed), and a bad thing for someone with a purse so messy for all I know the WMD are in there. I found four parts. The only problem is that there are actually five, and the missing part is a bespoke little spring that makes the doomaflatchy stay firm against the whatsis so the whole thing works. So I wrote Kensington and asked them if they sold a spring or could provide one. Now, I’m sure Kensington doesn’t replace entire units for every customer query or problem. I’m guessing “you need an X fuse” is their most common response, and if I could fix this with a fuse, I would. I also suspect that tepid reaction to their new unit might make it good policy to send out freebies for customers with problems with the old ones. But I already adored Kensington for the value this product had added to my life — and if you think that’s an overstatement, try driving from Tallahassee to Atlanta with only the radio as your companion (which is why it usually stays in my purse: so I have it when I rent cars). For that matter, try driving to Publix from your home when the local public radio talk show is all a-chatter about poor picked-upon Mr. Vicks who ain’t done nuthin wrong. In exasperation against local radio programming I have used my iPod and my FM transmitter to create Radio Free Tallahassee, and I now donate directly to the public radio shows I regularly download. My iPod transmitter isn’t some miscellaneous bit of technology; it’s part of my local survival strategy (and I went through several other brands before finding one that worked). So while I wait for the new transmitter, I shall hum to myself quite a bit — and the song shall be “If only we could all be like Kensington.” When my transmitter finally meets its maker, the chances are extremely good I’ll buy another Kensington. If the new unit is a dud, I’m going to be a lot more forgiving, and still willing to give Kensington a chance, and if I like it, I’ll coo all over Amazon. Overall, they’ve set the temperature of my warmth for their company far higher than it had been before I reached into my purse and came up with a handful of metal and plastic. Meanwhile, in preparation for some Very Serious Work (research about research — the thought makes me dizzy), I ordered The Black Swan from the Leon County library. It arrived, but in the wrong format (CD instead of print). So I wrote the library, and guess what? I got the same service. The library didn’t say “You ordered the wrong format!” There weren’t demands to come in to get this right or even call them (this was all by email). They immediately reassured me that the right format was on order — and guess what, they even told me when it might arrive. I know they have funky old catalog software that makes it difficult if not impossible to put this last bit of information into messages, but how wonderful that they took the time to share it with me so that I didn’t have to give up and buy the book from Amazon. I’m always happy at that library — if they don’t have a book, they get it for me fast, and everyone is so friendly. I feel welcome there. But I felt welcome by this email exchange, as well. The key here is understanding that it’s not the freebie or the close attention to an interlibrary loan. It’s not about the policy or the workflow. It’s about the focus on making — and keeping — happy, even passionate, customers. This was written by K.G. Schneider. Posted on Tuesday, February 19, 2008, at 7:38 am. Filed under Customer Service, Tallahassee Living. Bookmark the permalink. Follow comments here with the RSS feed. Both comments and trackbacks are currently closed. 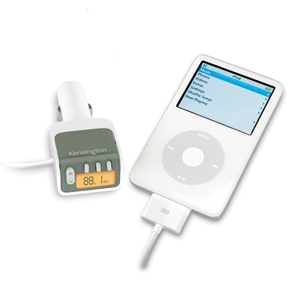 Which iPod transmitters have you gone through, and why do you like the Kensington best? a fair amount but am not in love w/ it, so am up for recommendations of an alternative. I had another brand earlier…maybe Monster…didn’t like it at all. I tried Belkin and had no luck. But I wonder if it isn’t car to car, area to area..? I just know that the Kensington had some glowing reviews and it worked for me. Dear, dear little transmitter..! ‹ What the hay, Chowhound?